If one of these holidays falls ON OR BEFORE your collection day, that week your day will be one day later then usual. Thank you for helping us "Keep It LOCAL"
curbside collection to new and existing customers. Call today to join ! "when you love what you do, you never have to work a day in your life". That's our philosophy throughout the company. This may explain why our clients are so happy to have joined the Orifice team! From one customer my first day in business to currently servicing over 3,100 clients my seventh year in business my outlook has not changed a bit. I realize customer service and reliability are the most important factors of running a successful operation. 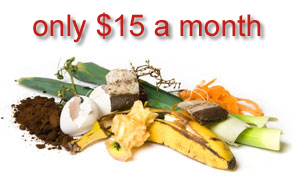 Orifice Recycling & Refuse offers flat rate monthly pricing for all of our clients. We do not have yearly price increases, hidden fees or surcharges! We are proud to allow our clients the peace of mind to always knowing what their monthly rate is. Feel free to contact me directly for a waste & recycling consultation, or to just "talk some trash"
We maintain our dumpsters, and roll-out carts by deodorizing, & sanitizing with each pickup from April through November. Orifice Recycling observes the six major holidays each year. If your collection falls on or after these holidays during the week, you're pick up day will be one day later. Always feel free to check our Facebook page if you ever have a question on Holiday or Weather schedules. 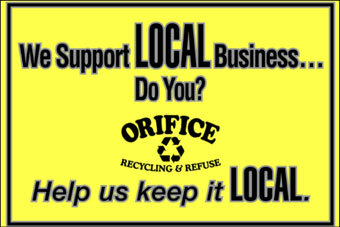 Orifice Recycling is proud to announce their donation to curb the cure for Breast Cancer. Please take part in making your community more aware, by rolling these carts to the curb!